Why is the American Jobs Machine Broken? HomeBusinessWhy is the American Jobs Machine Broken? The June employment report was decidedly weak, and serves as the latest blow to the V-shapers – if any are even left. It once again left me feeling that something is very, very wrong at the heart of the American economy, something that is much more structural than cyclical. Consider too that US policymakers appear completely unable to adequately address the latter problem, now hampered by fear of deficit spending and the threat of the invisible bond vigilantes. Yet the structural challenges are even more daunting, and I fear that the Washington establishment is simply incapable of the paradigm shift necessary to address these challenges. Only one word describes the American labor market outcome of the last decade – abysmal. Not only is job growth well below trend, but the quality of jobs is in question. The jobs deficit is even more striking considering the supposed gains in productivity over the past 15 years. Job growth should not stagnate. Resources – including labor – released via higher productivity are supposed to be channeled into expanding sectors. Moreover, productivity growth is supposed to yield improved economic outcomes via higher real wages. Yet as spencer famously shows, labor’s share of output has been steadily decreasing since the early 1980s. 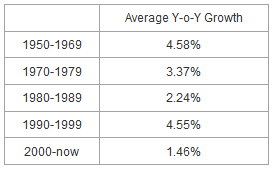 This downward trend was interrupted by gains evident during the tech bubble of the mid-1990s. Apparently, only during that brief, shining moment of generational technological change did the productivity story work as we believe it should, at least since the early 1980’s. 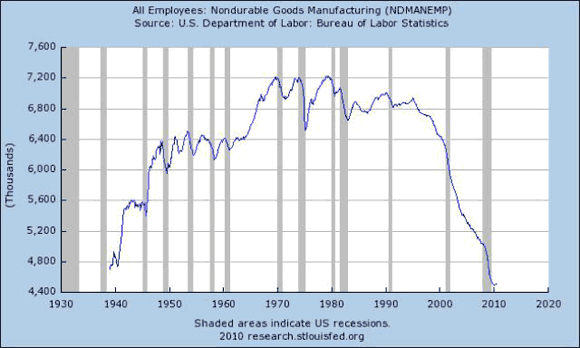 Why has the American jobs machine failed so spectacularly? This should be the most pressing issue facing economists and policymakers. Are either up to the task? The relative shrinkage of the manufacturing sector in the US (and elsewhere) from about 30-35% of total employment then to under 10% now was somewhat painful, especially in places where manufacturing was concentrated; it fostered some protectionist sentiment and some protectionist measures, and it induced a variety of other ill-considered policy responses. But, broadly speaking, the adjustment did not precipitate any major economic or social convulsions. This experience suggests that a similar-sized labour force adjustment can, once again, be handled by the market system – with some help from government. 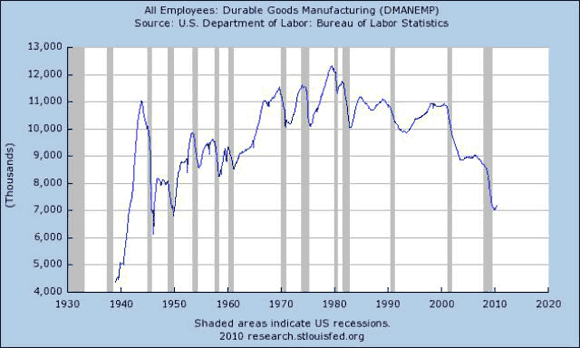 Note that nondurable manufacturing employment enters sustained decline in the mid-1990’s, compensated initially by employment in the durable sector, but that sector too began what looks like permanent declines in 2000. Note that a number of trends all begin in the 1980s. Absolute manufacturing declines, the rise of persistent trade deficits, the decline in labor’s share of output, growing income inequality, and the Great Moderation. That the combination of these trends is coincidental seems unlikely. More unlikely given that the capacity surge on the 1990s gives rise the improving economic conditions for the population as a whole, at least when view through spencer’s metric of the proportion of output going to labor. If manufacturing is critically important to driving trends of national well being, an exploration of the decline of that sector is crucial. But that exploration almost always leads back to a very difficult place – international trade. And every right minded economist and policymaker knows unequivocally that free trade is good, and to even question that assumption makes one an ignorant heretic who has never heard of Smoot-Hawley. Therefore, the examination ends. Manufacturing’s decline simply cannot be a problem if it is consequence of international trade because everyone knows international trade is good. Just as everyone “knew” that the increased liquidity offered by exotic financial instruments and the free flow of capital was unequivocally good. But that is a different story. Indeed, the establishment will defend any assault on free trade with a simple, seemingly unassailable story: NAFTA was followed by the 1990s jobs boom in the US even as the current account deficit widened. Therefore, free trade does not have net negative impacts. Winners and losses, yes, but the former outweigh the latter. I have told that story myself. Such a story, of course, denies the importance and unrelated rise of information technology – a once in a generation tectonic shift that, ironically, vastly accelerated the offshoring of manufacturing capacity the following decade. But even more importantly, it fails to acknowledge that while free trade produces net positive effects, that process can certainly be upset by the deliberate manipulation of currency values. And make no mistake, those values have been manipulated. There can be no other excuse for the massive buildup of official reserve assets in global central banks. I don’t think it is a coincidence that the absolute decline in manufacturing accelerated in the wake of the US strong Dollar policy, which provided the freedom for China to pursue an aggressively mercantilist economic strategy, perfecting what Japan’s policymakers began in the 1980s. Thus I don’t think the pernicious hollowing out of America’s industrial base is simply the result of comparative advantage. I grow increasingly convinced that the disappointing economic outcomes of the last decade are the culmination of decades of industrial neglect. That economists have dismissed industrial decline with a story of high value knowledge-based workers, a story with specific relevance to the tech boom of the 1990s but that is now defunct. And I am increasingly convinced that these trends have been largely dismissed by the economics community because acknowledging them would cast doubt on value of free trade, failing to recognize that currency manipulation was turning free trade into a zero-sum game. In short, I have become a heretic. Neither Grove’s diagnosis nor his proposed solutions will persuade those who are convinced that protectionism of any kind is folly. I am not entirely convinced myself, and suspect that he may be underestimating the likelihood (and consequences) of cascading retaliatory actions and a collapse in international trade. But the argument must be taken seriously, and anyone opposed to his proposals really ought to come up with some alternatives of their own. On the one hand, you are right, any move towards protectionism (or even permitted-within-WTO pushback against mercantilist trade partners) could very quickly get ugly. But the flip side is I wonder if we have a level of global integration that is inherently unstable (both for Rodrik trilemma reasons, international economic integration with insufficient government oversight creates political problems, plus the Reinhart/Rogoff finding that high levels of international capital flows are associated with financial crises). If so, we may have a short run (messiness of reconfiguration) v. long term (costs of really big financial crises) tradeoff. This is a good point. The purpose of my post was to highlight Grove’s analysis of the symbiotic relationship between innovation and scaling (which I think is both interesting and valid), and to challenge those who are opposed to his reform proposals to explain how they would deal with the situation in which we find ourselves. Passive tolerance of mass unemployment, widening income inequality, and withering innovative capacity is not an option. There may be an additional implication for fiscal policy. Declining rates of industrial capacity investment suggest that maintaining full employment requires acceleration in other sectors. In the last decade this was accomplished via the redirection of investment capital to housing and consumer spending with a related debt bubble. The unsustainability of that approach is now evident. Thus, if willingness to invest in industrial capacity remains weak, we can expect that that the government sector will need to fill the gap for much longer than many believe. In short, if domestic investment is limited not by negative animal spirits, but by a rational fear that such investment will rapidly be rendered obsolete by the mercantilist policies of other nations, then government investment becomes ever more important. Bottom Line: Something more than cyclical forces is weighing on the American jobs machine. 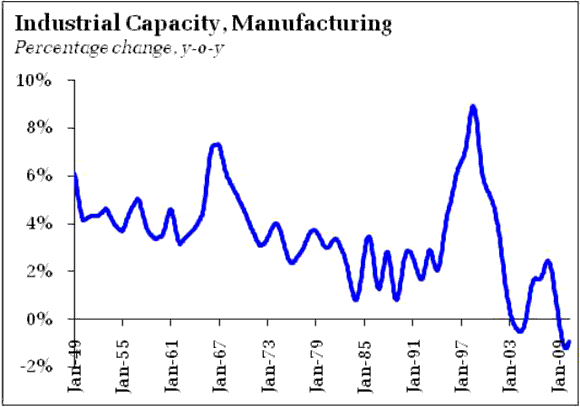 Here I have tried to extend the Grove/Smith/Sethi discourse with additional focus on absolute declines in manufacturing jobs and distressing declines in capacity growth rates. These trends may be critically important in understanding the dismal performance of US labor markets. If they are in fact critical, they raise serious questions about US trade policy – questions that few in Washington want to address. Given the extent to which manufacturing capacity has already been offshored, those questions go far beyond the recently announced tiny shift in Chinese currency policy. Simply put, accepting the importance of manufacturing capacity and the possibility that offshoring has had a much more deleterious impact on the US economy than commonly accepted would requrie a significant paradigm shift in the thinkink of US policymakers. If you scream “protectionist fool” in response, then you need to have a viable policy alternative that goes beyond the empty rhetoric of “we need to teach better creative thinking skills in schools.” That answer is simply too little too late. 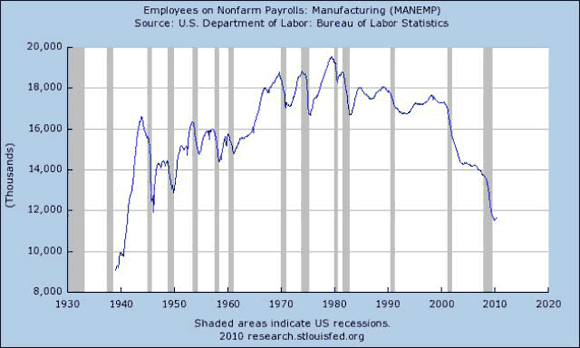 5 Comments on Why is the American Jobs Machine Broken? #1- Mass unemployment needs to be dealt with. Agreed. #2- Why is income inequality even a problem? In and of itself it really doesn't matter — if there are more rich people, they'll pay more taxes, right? #3-a- Why should anybody think that we're losing our capacity to innovate? b- And if we are, how does embracing a bogus populist narrative about bringing back manual labor jobs that no longer exist help make us more innovative? I've heard all about the economic rationale for seeking free trade, but why does it seem like no other nation has embraced the idea more than the United States? I've always thought it was due to an arrogant belief that Americans were going to be the CEOs, inventors, and innovators of the world, while the rest of the world handled all that messy production stuff. We've discovered that not only is the rest of the world not going to concede the high-value "thinking" work to us, but that the American economy has become somewhat of a lottery, with everyone vying for an ever-decreasing number of high-value jobs lest they be relegated to poorly compensated and unfulfilling service jobs. There's simply no balance in our economy anymore. Uhhh, excuse me? No other nation has embraced free trade to the extent of the United States? Have you ever heard of the British Empire, which relentlessly practiced it during the nineteenth century, to their benefit? I don’t think it is a coincidence that the absolute decline in manufacturing accelerated in the wake of the US strong Dollar policy, which provided the freedom for China to pursue an aggressively mercantilist economic strategy, perfecting what Japan’s policymakers began in the 1980s. Thus I don’t think the pernicious hollowing out of America’s industrial base is simply the result of comparative advantage. It's called "technological unemployment." Why do you think that China has shed so many manufacturing jobs, too? Manufacturing employment is going where all the farming jobs went, and blaming this on free trade (which actually has little impact on employment) is ludicrous.